Yesterday, I went to get our beautiful ketubah framed. 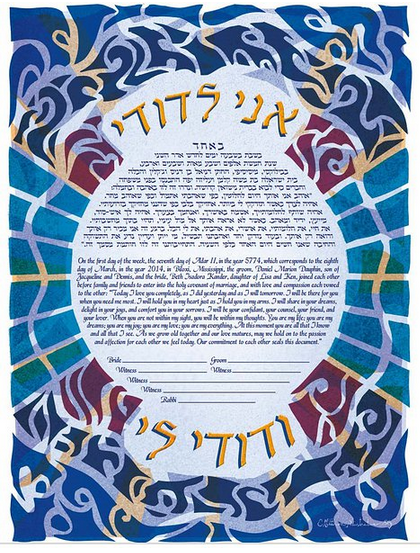 The ketubah is very special; it was a gift from some of my sweet coworkers, and was custom designed by our artist friend Christina of C. Mattison Illustration. Obviously, this document matters a lot to us, symbolically and physically. So when I had to hand it over to a guy at the framing place, and he was my age but basically toothless and kept wiggling his finger in his ear, mining for wax as we spoke… well. I was nervous. “I’ll getcher done,” he said, finger thrusting again into his ear. I wanted to walk out right then with the ketubah, rather than abandon the poor innocent wedding document. I felt odd, leaving her in the grubby hands of this disinterested man. But no place else in town could handle that big custom framing job on a quick enough time frame, “guaranteed.” Thus, I handed over our ketubah and left, feeling nervous. My misgivings continued to mount: He didn’t even know what a ketubah was! He didn’t care! HE MIGHT GET EAR WAX ON HER! Today, I got a call that the framed ketubah was ready—earlier than expected. I went in to get it, feeling the lingering trepidation. Toothless Ear Wax Man was not there. Instead, a brusque middle-aged woman, efficient but not warm, was behind the framing counter. I handed her my receipt, and she went to get my order. She brought out the large, now-heavy framed ketubah, and brusquely peeled off the tape from the crisp brown butcher paper to reveal the handiwork below. “It’s beautiful!” I said, relieved, when I saw it. “Yeah, that’s good,” she said, re-wrapping the butcher paper. She matter-of-factly checked me out, handed it over, and then as I turned to heft the ketubah and heave it out of the store, she cleared her throat. I looked at her, the efficient stranger at the framing counter who knew what this paper-wrapped item was and why it was so important. Suddenly, I could tell my memory of getting this lovely ketubah hastily framed in Mississippi was going to be far sweeter (and way less waxy) than I had previously thought. “Thanks,” I said, meaning it, and carried our ketubah out to the car.